Some commenters were shocked that I consider breaking the law an option for poor people. They considered it some line never to be crossed. After all these laws protect such morally unquestionable rights as the right to live, be unharmed and holding your property. How could anyone near any moral say anything against them? Well, could you imagine to join a society, where killing innocents for bounty is the common form of income? Would you go out with your friends every week, invading innocents homes, murdering them, dancing on their corpses and take their belongings? Would you do it if it would be the only way to get food? No. You already do it just for fun. You play World of Warcraft, so you willingly take part of a world where the proper way of getting stuff is killing its owner. And you don't just kill for survival. You could level without killing anything. And after top level, you could do anything without killing. You don't have bills to pay. "They are evil" you may say, but on what ground? Some NPCs said so? They are lying! No dungeon mob ever left its dungeon. None of them invaded your towns. None of them attacked you unless you invaded their dungeon with the obvious intent to slaughter them and take their belongings. You also torture them, or kidnap their children if you are properly paid. Some morals you have! What? These are the laws of the game? Of course they are and that's the point. Laws have nothing to do with moral. They have everything to do with power. Laws are set by someone or group who have the power to set them. Sooner or later most people will find them moral, as they want to believe that the world is just. But that's irrelevant. Even if everyone would know that they are immoral, that would make no difference. Laws stay until someone changes them. Two kind of people break laws: the powerful and the stupid. When the lawmaker group still have the formal position but no longer the power to enforce the rules, those who are without position but with power will overthrone them. That happened in the French Revolution or in the American Independence War. These cases are called revolution because the new power group took formal positions acknowledged by other parties. If you are a successful person, you have power yourself. You can be a member of the powerful group. For example you can be a highly ranked and payed soldier of a dictator. In a democratic countries you can vote on the election. Such systems exists for one reason: they are more powerful than their alternatives. The voting free citizens create more resources, more innovative than a bunch of slaves who work only in fear of punishment. The production of the free country is larger than the production of a non-free, so it will win over it, just like it happened in the Cold War against the communists. The dictatorship is more effective than the tribal anarchy, so it will win over it as we can see all over Africa and Middle-Asia. Am I one of these powerful people? Yes, as I am a voting citizen of a democratic country. Do I break laws? Why would I? They are mostly my laws. They are created by my group in order to create an environment where we can flourish. It allows taking the money of the idiots by trading but disallow taking my money by robbery. I love most of the system, why would I break it? trying to shift power from the socialist to the capitalist subgroup of my group by persuading people to "M&S does not deserve help". playing the system, by working much less than I could, since the tax is progressive. If I work half, I get half payment, but my tax is cut by 65%. I spend the other half-time with hobby and tax-free work (fixing my own car, painting my own wall, cutting my own lawn). The other law-brakers are morons. People who cannot evaluate power and believe that a gun or a knife makes them powerful. They are incapable to see the system, they believe they are 1 vs 1 with their victim. No, it's him vs victim+cops. In extraordinary cases, he can win, typically if the victim is especially weak but have especially lot of resources. The guy who walks alone with stacks of money in his pockets or the guy with million dollars paintings in his unguarded home will be robbed. Ordinary guys are only robbed by idiots who are either killed on the site by the self-defending "victim", or captured later by the cops. He loses not because he is "evil" or "immoral" but simply because he is weak. He is usually a drunken homeless or a young gangster from a non-functional family. They are way too dumb to find a decent job, how could they beat the system? There is a third group: the whiners. They don't have power, want some and believe that whining about "right and wrong" will make difference. It doesn't. These are the clean classes but the world is never black and white and in the gray area is the chances that the poor "no formal power" people can take. The grey area is formed when the people with formal power have some real power but also the ones with no formal power. The Pirates of Somalia is one perfect example. The Western World has formal power over the seas. They can tax shipping companies, Somalis cannot. However they don't have enough power to secure the Somali seas, so the pirates with guns (=power) can tax ships if they are lucky. On the other hand they don't have enough power to officially control the zone, setting up internationally acknowledged shipping tax, since their "navy" would surely lose a direct battle against Western warships. Such situation creates a divided-power situation where subjects (the ship-owners) can choose to pay both, or trust in luck that they can evade one of them. Since there is no "set way", you can have many options to be successful. You can be a pirate, you can provide services for pirates, you can spy on the pirates for the ship-owners or the Westerns. Notice that out of these opportunities, only the naval spy are "legal" as the other sides lack the formal power to give you such status. Other grey situation is where the formal power group have real power over most fields but not all. However for moral reasons (=whining) they don't acknowledge the limitations of their power. While overthroning them is impossible, "locally overthroning" them is. For example the "decent gentlemen" find gambling, drugs and prostitution "immoral". They lack the real interest to stop them (why should I care if some idiot wastes his money or health on these). They could be stopped if every building would have spy-cameras and every people would have blood test every week. Do we have such power? No. Do we really want to have it? No. The honest thing to do would be to acknowledge our lack of power to stop them. The smart thing would be to incorporate them into our system, just like the smart kings shared their power with the upcoming citizen class to prevent revolutions, forming constitutional monarchies. We could make them pay our tax. But instead, listening to our whining members we formally ban them. Of course it won't stop them from existing. Since everything needs government, a "crime organization" is immediately formed to do the job. The situation is similar to Somalia, as both the bruisers of the mafia and the cops of the official authority have power. Someone can find his living in these grey areas as worker in the "forbidden" industries. You can join the "crime" organization, you can provide services for them and you can spy on them. These are not my dream jobs, but they are jobs. Finally: back to moral. As we already saw, moral has nothing to do with laws, just power. After all, the Nazis were anything but moral, still they could gain formal power in most of Europe and set the most immoral laws ever. They were followed still (except for a few "criminals"). However there is some kind of "natural moral" that says that a system built on 0 sum games cannot last forever as no one is motivated to produce anything. The grey jobs mentioned above are not simple wealth redistribution actions like robbing or taxation. There is work done (drug created, illegal casino run, sexual action of the prostitute), so it's an industry. Ugly one, in some countries illegal one, but still. And also remember that what is illegal in one country (or state or province or county) might be legal in another. A famous example would be prostitution: by reading some comments it is illegal is many states of the United States while totally legal and institutionalized in others, such as Amsterdam in the Netherlands. Another example are dry counties in the United States. In these counties it is illegal to sell alchool while in the next town in the neighbooring county it is legal. So before jumping and saying "do not propose illegal alternatives", you have to put these alternative into contexts. Just something to add, beside laws and morals, you forgot to talk about "ethic". People don't do the "wrong" thing because they might think that it is unethical, but, as ethics are unique to each person, it's the way they judge what's right or wrong, some people might consider "breaking the law" while others don't. "No. You already do it just for fun. You play World of Warcraft,"
Real world and World of Warcraft are different. 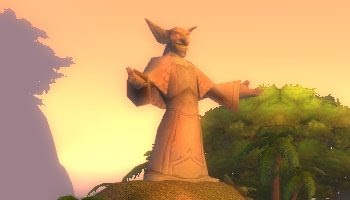 The real world ethical/legal issues you describe are not issues in WoW because well its a game. "I don't love the system completely, for example I hate to pay tax. However I'm fully aware that the welfare exists not because of some evil conspiration..."
I love the leap of logic that went on here. You don't like paying your taxes because of welfare. Many many things are payed for by taxes, like roads, military, etc. We pay taxes, the government keeps society (mostly) functioning. Gevlon, I have a suggestion: how about you start a seperate blog for your 'philosophy' posts? 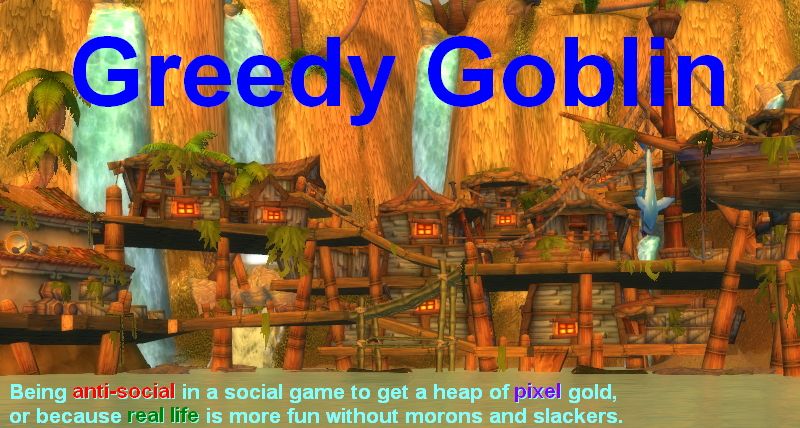 They have close to nothing to do with in-game goldmaking, which is what this blog is about. If you cannot think of a new way to make gold every day, or an expansion of your current ways etc, you can make it about some other aspect of WoW (your experience raiding, etc). Additionally out of curiosity, what 'powerful group' do you belong to? Am I just overanalyzing it and all you mean is being a citizen of a democratic country, or do you mean an "official" group (the IRS, etc)? the difference between performing amoral actions in a game vs real life is the target of your action. When you go and slaughter npcs - you are not killing living breathing beings. You are virtually destroying pixels on the screen that will respawn several minutes after you killed them. Npcs have no feelings, no families, no self awareness, no LIFE to speak of. Comparing morality in a game to morality in real life is preposterous. Morality aside, pragmatically - breaking a law is a poor option for poor people precisely because they are not the ones in power. So they are more likely to be discovered, punished to the extreme and as a result, make their situation even worse then it was before. I have sometimes hard time following in which parts of the text you're still describing World of Warcraft and in which parts you're already doing the real-world analogies. So nice of you to mention the "constitutional monarchy". On a side note: I'm at a loss. Maybe I've read it somewhere else - on another WoW economics blog - so I'm sorry if I have mistaken your blog for another, but why do people keep on insisting that democracy is The Best System Ever? Monarchy always has always given more freedom to the people (fewer laws) and the taxes were always lower (less bureaucracy).Any Goblin values freedom (especially the economic one, meaning no state-regulated markets) and low taxes. It is interesting that Anonymous brought up Amsterdam. Until fairly recently, protitution was not legal there. Also, marihuani is still not legal there, even though many (foreign) people think it is. Why then is it not prosecuted? Because the Dutch government decided that it is more harmful and costly to prosecute these things than to just let them be. Marihuano in particular is left as a reletively harmless option for those who wish to go into illegal stuff, while harmful alternatives such as heroine are prosecuted. The result is that under the Dutch population, there are much less drug related issues than elsewhere. Of cause it also creates a problem for people who don't see it this way. French and Italian politicians now and then scorn The Netherlands for these terrible vices. Also it attracts tourists for the things they cannot get at home. While they bring money, many of them are very much M&S. (for some time it was actually cheaper for English drunks to take a plane and get drunk in Amsterdam then to drink at home). Something similar is going on with the pirate issue. While a lot of people whine that pirates should not be. It is easy to see that letting it be is cheaper than prosecuting the pirates. If these pirates raid 100 ships for 1 million each (ransoms have repeatedly been reported as being reasonable), it would still be much less than the cost of the fleet needed to solve the issue. Can you imagine what it costs to operate a navy frigate with a crew of 300 people for a year? The common grounds between Law and Morality is that they both represent conduit directions conceived for the purpose of optimal fonctionement of society. However, the difference between them is the simple fact that laws are usually imposed by a certain government and reinforced by different organisms of the law, whereas morality is written within our conscience by our early age contacts with the surrounding culture and it's in some way self reinforced. Building upon this, the optimality I was referring to, fundamentally differs from one case to another. Laws usually aim at a large scale of people co-existing in the same system, whereas morality it is more often than not constrained to the small circle of people we interact with. Lastly and most importantly, laws are written black and white whereas morality as something interpreted by the human mind it is much more superfluous. And I believe this is the biggest confusion people make when dealing with these two. "Why shouldnt I do this thing?" The answer a) means because it is against the principles I was raised, whereas b) means, because if get caught I will be punished. Conviction and Fear. Really different. Now, the reason why people confuse them is the fact that moral values are usually bend in order to match the current laws. Thus, the majority, who under the current laws has an apparent optimal existance, embraces the law as their own morality. This is not true for everyone. The poor or people that live in other places than ours live under different rules, be they moral or legislative. Thus judgement of their reasons/actions withing our own moral system is flawed. For the particular case of African countries, the starving joining a rebel cause or working for a drug/diamond lord it is not an immoral act. It might be illegal or not depending on that place, but we must be conscious of the fact that as morality is a RELATIVE concept to each and everyone of us, it cannot be universalized. I don't understand your argument... because laws can be created that are not moral therefore all laws are not moral therefore can be broken w/o moral objection? Yes it is true that a dictatorship can create laws that are immoral and unpopular. Generally speaking these dictatorships don't last more then a few generations because of this. The moral guidline of the general populace has to be appeased or they will eventually rise against the government. Taking someones land or property or taking ones life is still immoral. No matter how you look at it. Even if the laws of the land dubbed this as fine and acceptable it would still be immoral. Morality can indeed change and shift. If the morality of the land changes to where the above practices are indeed moral then the laws have to change to reflect that or again risk an uprising. Going back to your statement that you only have 2 choices to either accept and join the others in supporting welfare or work to pay less taxes... there is a 3rd option in educating those M&S to not be M&S. Granted this doesn't work for 100% of the population but every person it does help is one less person on welfare. Hmm. So I have to ask, then, is it a reasonable option for somebody struggling to get minimal paying employment for paying their RL bills to farm gold in WoW for most of their days to sell for real money? Which would be more harmful, for them to accept welfare money from the government, or to annoy people in Azeroth every day hogging up the good spots for farming elememtals along with whelplings and fireflies? M&S= Morons and slackers (God, this is asked at leas once for post). Besides that, capitalism allows that the people with true skill, power of whatever you call it, are the ones that rule, instead of a monarchy, where the ruling class can rot in their own corruption and screw the rest of us. With capitalism and democracy most of the time the trully skilled are in the top, and they need to always prove that they deserve to be in there. Or they are just substitued for the most skilled one. Nobody its unreplaceable. Are you sure the welfare state isn't the most efficient way of pacifying the M&S population of the country? Abolish it, and at least in the medium term, you will have a massive crime problem, and that's expensive to deal with. (Or more likely, you fail, and your quality of life goes down on average). Think of the welfare state in terms of how it serves us, not in terms of how it serves them. We instituted it for a reason, and if you *believe* the people in power when they say it was compassion, you might just be falling for their lies. Interesting article and reminds me of Churchills quote "History is written by the victors". And so are morals & laws. Isn't the Question more if it is better to have 40% (or whatever it is) tax on salary, then having to fear that the morons go out and take 100% of your funds by force? It is more about what would happen if they take their "bad" opportunities. Changes are high that we will be the ones suffering in that case. The goverment is the one which allows you to earn more money than most people by protecting you and your wealth from the mob (mob as in the real life usage of the word). I doubt you would be able to protect you and all your belongings yourself in a place with a collapsed goverment, and you probably wouldn't have enough to pay your own "army". So, yes, welfare is a way to ensure that the people who get welfare don't turn into wild animals with forks and flares. I think that the rich get more usage out of the government then the poor.